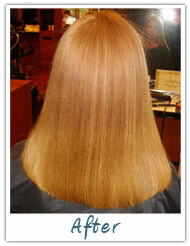 Brizilian Keratin Treatment is a revolutionary natural treatment for all hair types. 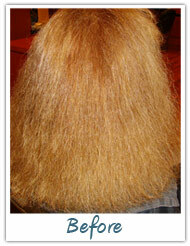 This is an intense treatment that leaves hair soft, shiny, frizz free and manageable for 2 to 4 months. It will turn “fried” hair into beautiful, soft, shiny, bouncy HEALTHY hair! It will straighten curly hair WITHOUT chemicals. It will add body and movement to brittle, fragile hair and prevent breakage and shedding. Total hair transformation without chemicals!!! - Quick - It is quick and easy to schedule. On average, the treatment takes one stylist only two hours. 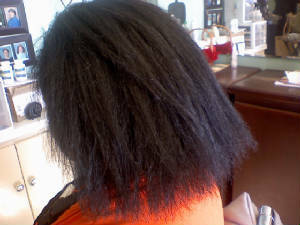 - Affordable - It brings the price of silky straight hair to a reasonable level, while remaining an upscale process. - Universal - It can be used on colored or highlighted hair. In fact, it can be used on any type of hair. 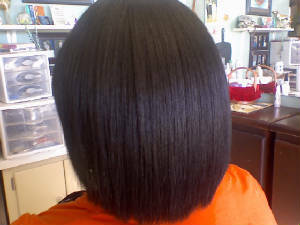 This service is being dubed a“chemical free relaxer” by many stylists. 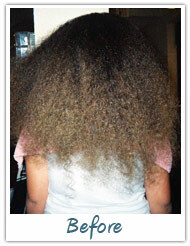 It produces amazing results to tame and relax natural hair WITHOUT ANY damage to hair. It can be used over ANY prior service! A great way to grow out of chemical services without the traditional damage of breakage. Wonderful treatment for Multi-Cultural hair!! Safe enough for children. - Gentle - It is NOT meant to be permanent and it DOES require redoing approximately every 3 months. That is why you can use it on children. That is why it blends with the natural growth of hair. - Natural - It does NOT use strong chemicals to open and close the hair cuticle in an effort to straighten it, “breaking the bones” of the hair shaft. 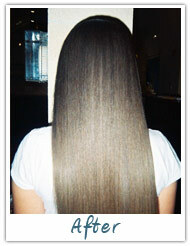 Keratin is a natural substance which comprises approximately 88% of your hair. - Healthy- It penetrates the hair repairing internal damage and coats the hair preventing further damage. The results are SOFT, SHINY, STRAIGHT hair. Your hair is in much better condition after the process than it was before. This service will help you be able to grow your own hair to unbelievable lengths! - Simple - Do NOT wet, wash or put anything into the hair for FOUR days. After that shampoo and condition with any product NOT containing sodium chloride, which will strip the keratin from the hair. - Simply Amazing - The results speak for themselves. As one client said: “I'm so happy I don't need my therapist anymore!”· Good for anyone who has hair. 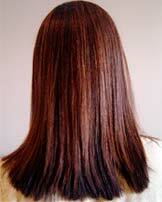 Keratin is a type of protein high in Sulfur and the amino acid cystine, making it tough, elastic and insoluble. 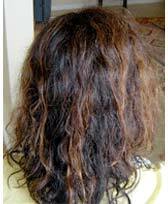 These qualities are fundamental to the strong structural role keratin often plays in nature. Is your hair dull, dry and damaged? Is it curly, wavy, frizzy, overly voluminous or unmanageable? Application of our keratin treatment puts an end to all that. The smaller keratin molecules penetrate the hair cortex improving and repairing the quality of the hair from the inside. The added strength, elasticity and moisture results in the smooth, soft, shiny and straightened affect. This hair moves and shines!! This hair moves and shines!! !